Can events bond your whole audience together? One basic hunger drove our early success. New England’s top architects, interior designers, and custom builders had long been doing stellar work for a sizeable and quite well-heeled clientele — but the national design press largely ignored our six states, unless there was a celebrity or a Manhattan-based firm involved. New England Home’s initial goal, therefore, was to give New England’s residential riches the highest quality presentation possible — to be a regional design magazine, in short, that looked and felt like the top nationals. New England’s professionals were hungry for high-quality attention. But another, equally deep hunger led our business in a direction we hadn’t anticipated. The industry we had set out to cover, it became clear, lacked a center. New as we were, designers and architects quickly began using our pages to keep tabs on what their friends and competitors were up to. We started fielding requests for information and advice: “My usual millwork supplier is really busy right now; do you know someone else nearby who can deliver the same quality?” We had thought that connecting the residential design industry with an affluent and design-aware public (their best local trove of potential clients) was our main thing. But it turned out that connecting these professionals with one another was just as important. Our primary method for addressing this new need? Events. Since 2005, we’ve become ever more involved in producing different types of events, all with the shared goal of helping our industry partners maintain a more robust professional network and do their jobs better. Our original brief, to “cover” residential design in New England as a publication, has really become a mission to “facilitate” or even to “participate in” residential design as a partner. After all, we prosper only if the industry as a whole prospers. Not just any event is beneficial to a business, however. My purpose here is to help you decide, using our experience as a model, if events could be a good fit for you. If so, the events you will want to undertake are best keyed directly to your goals for connecting with, influencing, or pleasing important sets of stakeholders in your enterprise. WHAT EVENTS WILL WORK FOR YOU? The first task is to identify your core constituencies and important subgroups. As publishing professionals, we naturally tend to fixate first on readers. But readers aren’t the only group that can contribute substantially to your success. Who are the people most instrumental in helping you find or create your content? Who are the people behind most of your revenue generation? Are there people who have an important regulatory or oversight role, or who greatly affect your public image? Each of these groups may be worth engaging via some sort of event. New England Home’s primary constituencies are: 1. our consumer readership, comprised largely of affluent homeowners and design enthusiasts, and 2. members of the residential design and construction trade itself. Readers can be divided up geographically (by state or metropolitan area, or by regions that correspond with certain activities, such as mountain or coastal resort areas), or by print versus online. They also divide socioeconomically: our very affluent qualified circulation cohort versus more aspirational subscribers and newsstand purchasers. Our trade partners break down into five subgroups: architects, builders, interior designers, landscape firms, and the owners and staff of various firms who support them with products, resources, or services. For another type of publication — a university magazine, say — core constituencies might be different: the school’s alumni association, the alumni themselves, the resource development department, and faculty who have a stake in getting their writing and research out into the world. But it’s important to be thoughtful about what categories or subdivisions could respond well to specific means of outreach. Opportunities can lurk where they are not expected. Next, identify needs that aren’t being addressed by anyone else, or that aren’t being addressed well. Match them with your organization’s strengths, even strengths that aren’t (yet) central to your mission. While starting up our magazine, we naturally got into contact with local builders’ associations and the relevant chapters of professional organizations, such as the American Institute of Architects and American Society of Interior Designers. They all had their own programming, of course, plus a few awards competitions and one or two tradeshows. Few, however, were making connections across disciplines or focusing specifically on the residential space. Our course quickly became obvious. Since we found ourselves already serving as a clearinghouse for information about New England’s various home-design professionals, we decided to embrace the “den mother” role wholeheartedly. Brainstorm programs that can help with those issues for your constituencies. Since 2005, we have undertaken a growing set of events, of different types and scale. Our biggest priority has been to bring together our regional industry, giving it a sense of pride and focus, and helping individual practitioners be more successful. On the smaller end are networking events, hosted and attended only by our advertising clients, and held in conjunction with each new issue of our magazine. These events are mainly social, but we use every opportunity to make introductions and encourage connections. Other events, which we undertake with community partners, are geared toward reinforcing our status as a true participant in our industry. A primary example is the B/A/D Talks (badtalks.com), now in its fifth season. We were asked by a local stone and tile supplier and a cabinetmaking company to partner with them on this annual series of panel discussions, where residential design and construction professionals come together to discuss topics of mutual concern, such as effective project team dynamics or how to get more women into leadership roles. 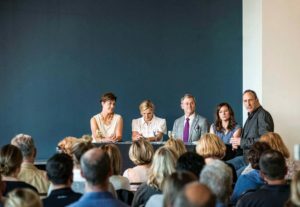 Similarly, we partner twice a year with the Wakefield Design Center in Stamford, Connecticut, on a “To the Trade Only” day of lectures, panel discussions, and book signings with prominent designers from across the country. Events can be revenue generators in and of themselves, but there may also be events that are worth implementing even if you only manage to cover costs (a few may even be worth an infusion of cash). New England Home and the co-producers of the B/A/D Talks, as an example, don’t make any money on the programs. But the series generates so much goodwill that it is still well worth doing. This is an ongoing process. As we get to know our colleagues and audience better, we consider new or expanded ways to serve them. At the moment, we’re considering a biennial designer showhouse, and we’re also exporting the B/A/D Talk idea to a subsidiary market in Connecticut. 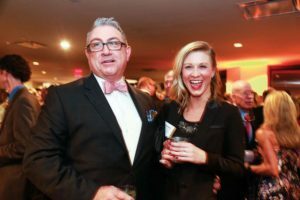 Big, public events — a food and wine festival for a regional lifestyle publication, for instance — may be the most tempting and obvious. But something smaller and more unexpected might end up being equally worthwhile. Perhaps a series of small faculty lunches might help the university magazine I mentioned above develop easier and more reliable access to a well of great content. (The equivalent for New England Home? A periodic “how to get published” presentation we do for groups of interested professionals.) Depending on your situation, online events may be an idea that deserves thought as well. HOW CAN YOU PULL THEM OFF? Triage your ideas to determine which are most feasible in terms of budget or work required. New England Home’s networking events are pretty simple to produce. Companies wishing to host these must be existing advertisers, and attendance is open only to other current advertisers. 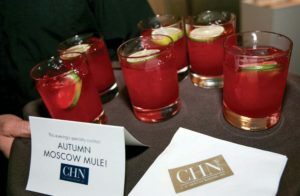 The host company provides the venue, the catering, and usually some small items for a raffle; New England Home handles publicity, manages the RSVP list, prints nametags, staffs the door during the event, provides an event photographer, and runs a page about the event in the magazine’s Design Life column afterward. 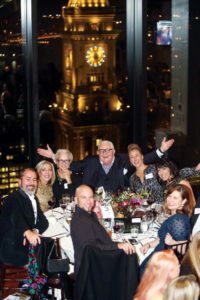 Events such as “5 Under 40” and the New England Design Hall of Fame are much, much more labor-intensive, but we decided that they are so important in making us stand out in our market that they justify significant investment. Some event ideas won’t make the cut. For us, we have done little involving the general public. 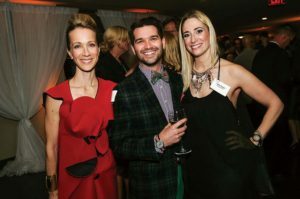 Event ideas to attract them have all seemed too expensive or difficult; also, many of the people that potential sponsors most want to reach — the high-net-worth sector of our readership — tend to be both very busy and extremely private. Most of our events would be impractical if we tried to do them completely on our own, or to fund them solely via ticket revenue (only two of them actually have paid admission). Paid partnerships and sponsorships can take many different forms, some tied into the structure of a particular program and some keyed to elements that most programs would have, such as food, liquor, event space, and decor. Our “5 Under 40” program incorporates two kinds of “structural” sponsorships. 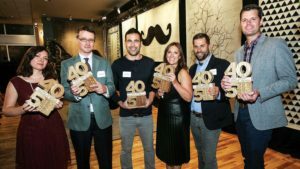 Each year, the “5 Under 40” winners (extremely promising young architects, interior designers, landscape designers, furniture makers, and members of related specialty trades) design custom rugs that are then fabricated by presenting sponsor Landry & Arcari Rugs and Carpeting. 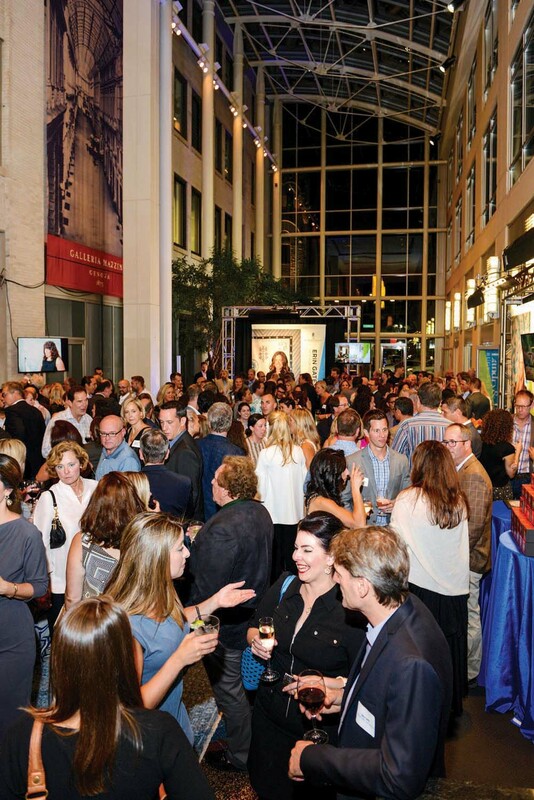 The awards event and an auction of the winners’ rugs take place in L&A’s downtown Boston showroom, and the associated cocktail party is hosted in a dramatic multistory atrium space just outside. 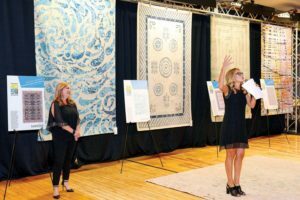 Proceeds from the rug auction go to a charity partner, Barakat, whose programs support basic education and literacy programs, particularly for women and girls, in Pakistan and Afghanistan (an area where many rug weavers live). Five other companies are each paired with one of the award winners as signature sponsors. Each sponsor-winner pair gets a special display station during the event, where slideshows of their work play throughout the evening. We consult with each sponsor on some kind of activity or giveaway to take place at the station as an added attraction. 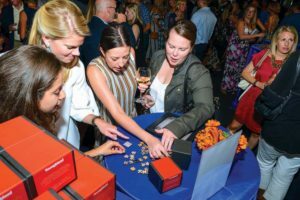 In one case, for example, a textile designer and her sponsoring architecture firm collaborated on decorative custom key chains that were given out to attendees. 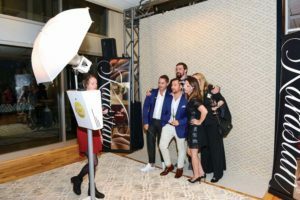 Other sponsorships are sold to cover the costs of catering, cocktails, and awards trophies; to provide a photo booth where partygoers can have playful photos taken for sharing on social media; and to provide some kind of branded goodie for attendees to take home. New England Home primarily sells event sponsorships to existing advertising clients as part of their annual program, giving them a maximally diverse opportunity to spend their marketing dollars with us instead of with our competitors. Depending on your market, you may also have success reaching out to florists; caterers; companies that provide decor and event rentals; and beer, wine, and liquor suppliers who will provide product on trade (or partially on trade) in order to be promoted to your audience. Including a charity component can help. 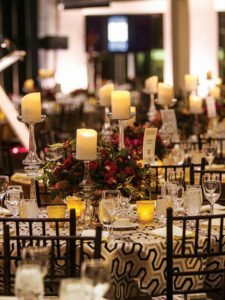 Partnering with a charity whose work is appropriate to the nature of your event, or finding some other thematically related way of giving back to your community, will help boost event attendance and minimize annoyance about ticket prices. People love the idea that they can attend a fun event, bond with their industry community, and do something to make the world a bit better all at the same time. Sponsors can be found here, too, who might, for example, underwrite free or reduced-price tickets for students. I’ve already described above how charitable work is integrated into our “5 Under 40” program via the custom rug auction. We also give the organization a table for the evening, where people can sign up to sponsor a year’s education for South Asian students. For the New England Design Hall of Fame, we donate $5,000 each year to a design-education program at a college or university in New England. A representative of the school is invited to speak, as part of the evening’s programming, about what class or workshop or guest speaker, say, is being funded. Finally, get a good event planner! This may strike you as an unnecessary expense, but for events of any real scale, an experienced professional can be a godsend. She or he will know the most appropriate caterers, florists, and rental companies; be familiar with the pros and cons of many local venues; and can be a trove of information regarding fire department regulations, police details, and other legal requirements that you might not ever think of. Your planner should also be able to help negotiate and review contracts, and might well be able to assist with PR and marketing efforts and managing ticket sales. ARE EVENTS REALLY WORTH THE TROUBLE? You obviously know your own publication, its mission, its needs, better than I. You’ll have to decide. Who are the groups of people important to your enterprise? I don’t mean just your publication’s readership, but also the people responsible for the raw material that becomes your content, the people responsible for your access to that content, the people with control or oversight of your operations, the people who hold the purse strings — or anyone else who otherwise has a direct potential effect on your success? Would a closer, warmer relationship with these people be helpful? Can you provide some kind of experience that would interest and attract them, to mutual benefit? Then go for it. New England Home’s experience has been clear. Our early realization that we had more to offer than just serving as a conduit to reach the public has been critical to our success. People we might originally have thought of just as advertisers now see themselves more as stakeholders. The professionals whose projects we feature in the magazine understand that they’re more to us than simply a convenient source of content. It might be an exaggeration to say that, today, we spend more time and effort on events than we do in getting out the magazine. But not much of an exaggeration. And every bit of the time and effort, so far, has paid off richly. Kyle Hoepner has been working to make magazines — as a typesetter, page-production artist, graphic designer, and editor over the years — since the mid-1980s. 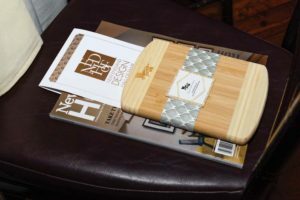 He is currently editor-in-chief of New England Home, a regional luxury design brand with offerings in print, online, and in person. Connect via hoepner@pagesthemagazine.com.